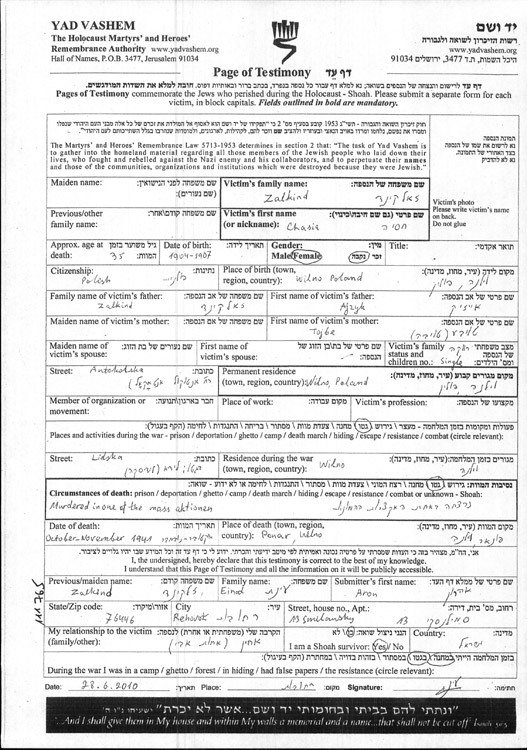 The Central Database of Shoah Victims Names is a unique enterprise undertaken by Yad Vashem to commemorate the names of the six million Jews, victims of the Holocaust. 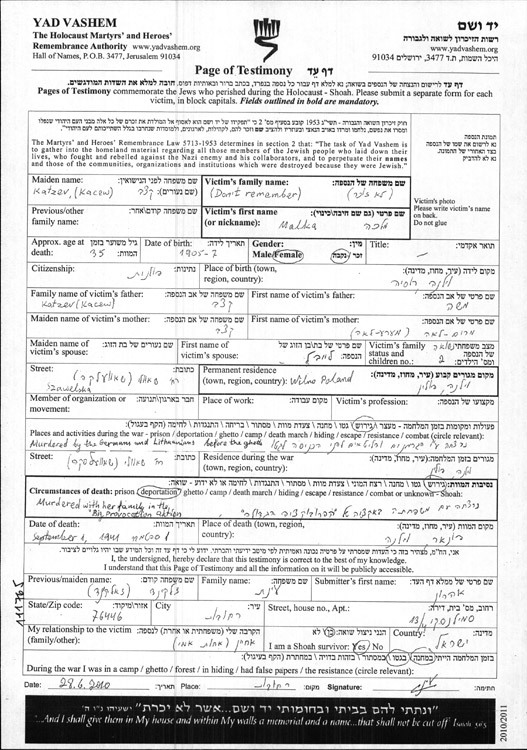 The Pages of Testimony, a project that began in the 1950s, bear the biographical details of many of the victims and reveal to us the story of the Jewish individuals during the Shoah and beforehand. 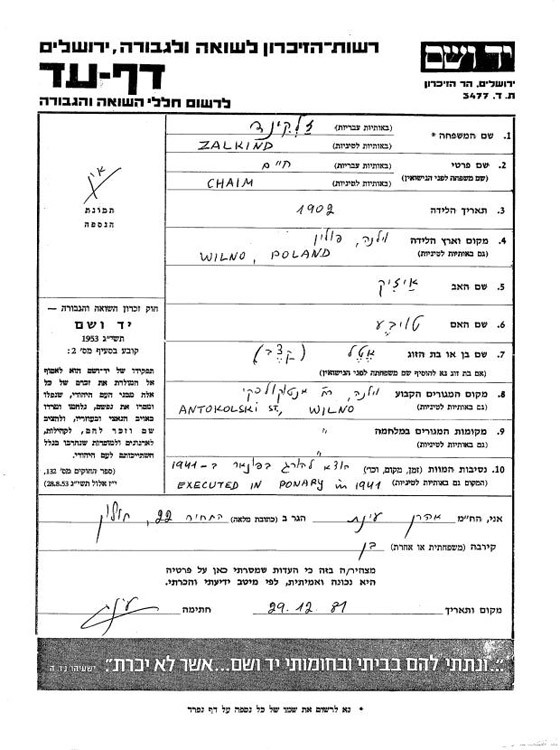 The following Pages of Testimony reveal the fate of the Zalkind family from Vilna. Aron Einat (Zalkind) was born in Vilna in 1934 to Chaim and Ethel (née Katsav), who ran a small grocery store. After two years, his brother Eliezer was born. During the occupation, the Lithuanians murdered his uncle Shalom and cousin Hirsch. In the first aktions,his father Chaim, aunt Malka, her husband Leybel and their two children were murdered at Ponary. When the ghetto was established, Aron's family was moved into the "small ghetto." Many of his relatives were murdered during the aktions that took place until the end of 1941. 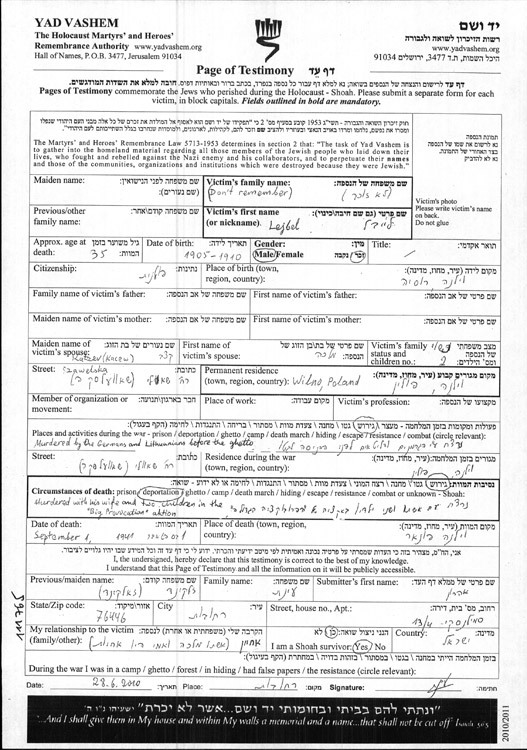 Aron was registered as the son of his uncle Avraham Kamenman, who worked at the HKP factory and was "legal." The same was not true of his mother and brother. A week before the ghetto's liquidation, in September 1943, Aron's family managed to get to a work camp the Germans had set up for the HKP workers. In March 1944, an aktion was carried out in the camp, in which 200 children and youth were murdered. Aron, his brother and a cousin managed to hide. In July, the camp was liquidated and Aron and his remaining family wandered among nearby villages until they reached the Red Army. After liberation, his mother made a living in trade, and Aron and his brother studied at the Jewish school. 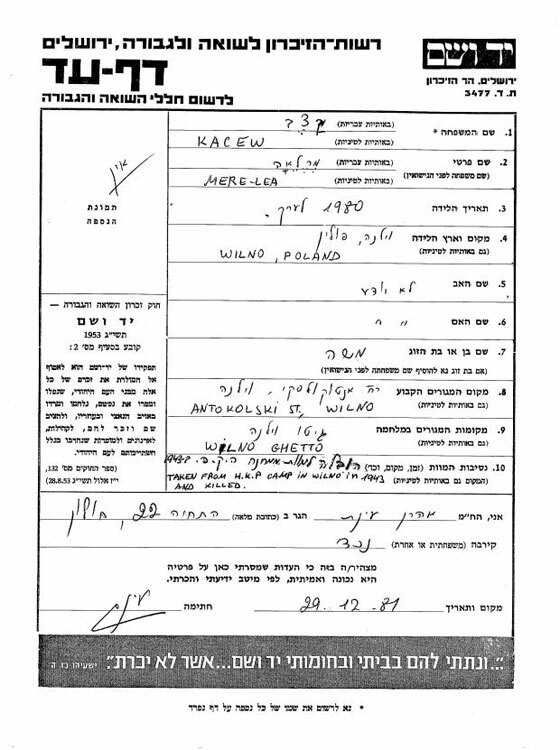 In the summer of 1946, the family moved to Lodz with their aunt Zelda, uncle Avraham and his wife. 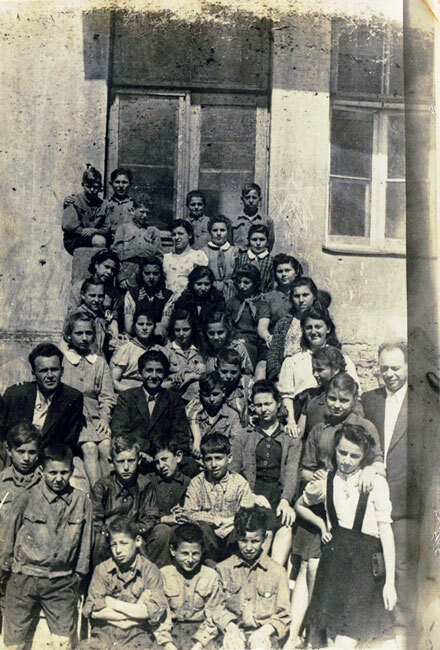 Aron and his brother lived in the "Koordinatzia" children's home and studied at the Hebrew school. In 1950, the family emigrated to Israel. Aron was recruited to the IDF and served in a number of positions, including training, administration, command and consulting abroad. In 1976, he was released as Lieutenant Colonel and began to work at the Diaspora Museum. He led groups abroad, instructed groups traveling to Poland, and directed and trained groups participating in the "March of the Living" from its inception (1988). From 1997, he guided youth missions to Poland a number of times each year, and in recent years he has led groups of immigrants from Vilna and its surrounds to Vilna and Lithuania. In 2006, Aron completed his doctorate at the Hebrew University on the subject of "Internal Life in the Vilna Ghetto." Aron married Amela, and they had three children – Chaim, Tomer and Ofer. 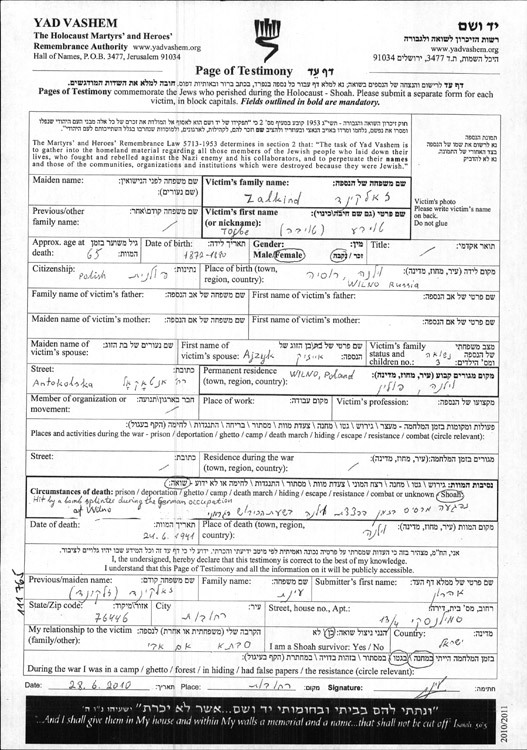 In 1984 Aron remarried, Esther, the mother of Leshi, Ori and Anat.